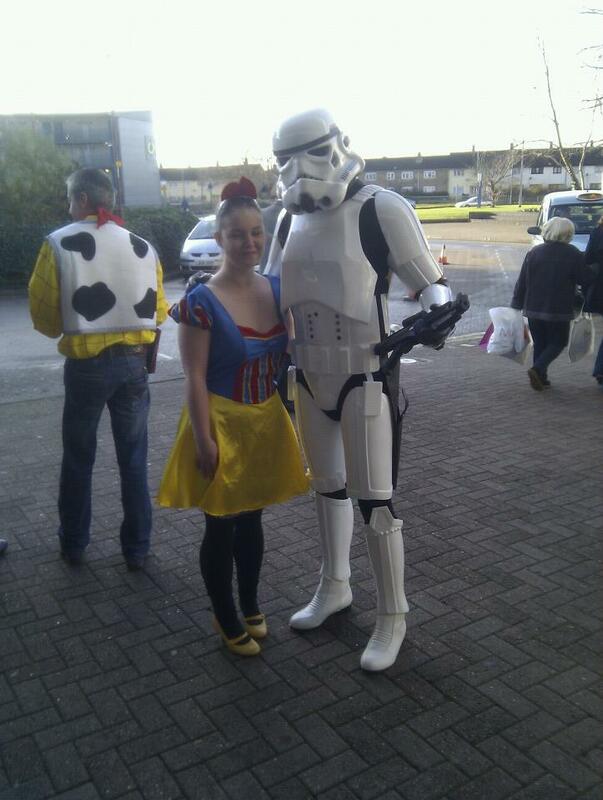 The weekend before Christmas Rooney and I had the pleasure of taking part in an event run by a local funeral firm (Daniel Robinson & Sons) which we got all dressed up for, me as Snow White and Rooney as a Storm Trooper. The idea of the day was to basically make a group of children and their families who had had a tough year with bereavement and illness feel as special as possible. They were picked up by limos and greeted by us in costume and staff from the funeral firm who were dressed up as different characters from Toy Story and pantomime heros and villains (from the local theatre’s panto cast) and then taken in to a church for a lunch. We went round to talk to the children and make it as magical as possible, then they then went off to watch the pantomime. The day was amazing and I hope that the children enjoyed it as much as I did – if they did then it was a real success! It was probably the first time in my life that I thought ‘This is what Christmas is really about.’ It was a day that I will never forget but there are two memories that will stay with me forever; I was talking to a family and the baby that the father was holding looked up at me with her big eyes and grabbed my hand and just stared at me with a huge smile on her face, and the second memory was a girl running up to me who was about 7 years old and put her arms around my waist and was asking her Mum to take a photo of us, she was so excited to be near ‘Snow White.’ It definitely made me feel like a princess for the day and made me so happy to give these children something to smile about. This entry was posted on Monday, February 6th, 2012 at 11:30 PM	and tagged with Charity, christmas, cosplay, Daniel Robinson & Sons, Event, Hibiscus, Snow White, Stormtrooper and posted in Cosplay/Costuming, Events, Star Wars. You can follow any responses to this entry through the RSS 2.0 feed. « New GoW novel coverart!